How will this display advertising guide help me and my business? Retargeting has become one of the most popular forms of display advertising. It gives you the opportunity to reach prospects or customers who have already interacted with your brand, to further persuade them into making a conversion after they've left your site. Targeted reminder ads served to previous site visitors are so effective in prompting conversion that they have one of the highest levels of ROI for digital media. This guide is for you if you want to know the options and best practices or if you want to know how to get started. It will also help if you are already running retargeting campaigns and want to make sure you are doing it right and are actually increasing your ROI. Constant changes in technology means that it is ever more difficult to keep up with the latest features in display advertising. Use this seven-step guide to find out how to you could achieve more from your retargeting campaigns. How is our ad retargeting guide structured? 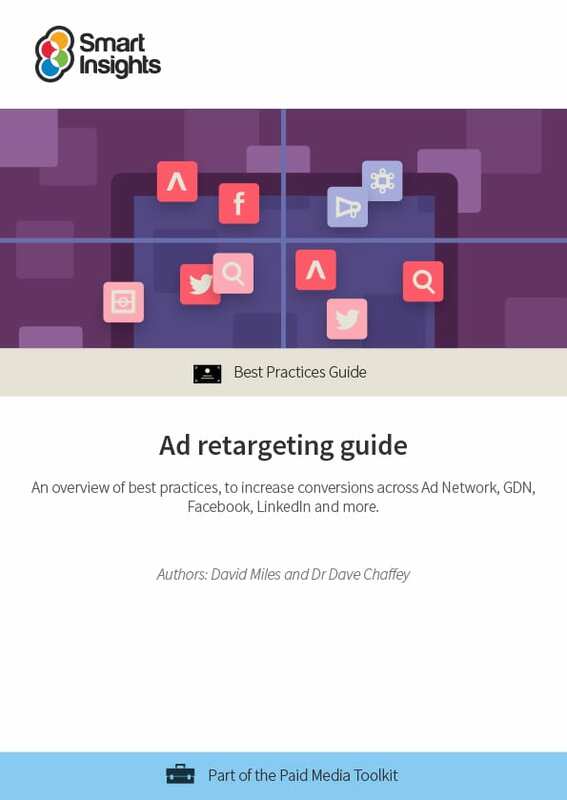 Related Smart Insights resources: Quick Win guide to Facebook Retargeting – a practical interactive guide to using the Facebook pixel for retargeting on Facebook. David Miles is a digital marketing consultant, trainer, and published author. For the past 13 years David has owned and run digital marketing agencies and training businesses large and small across the UK and Europe. Currently, David is the founder and CEO of The PPC Machine, a boutique agency that helps medical professionals grow their practices using pay per click advertising platforms.